This cute free pattern for wood crafts will be a start on your decorations for summertime! 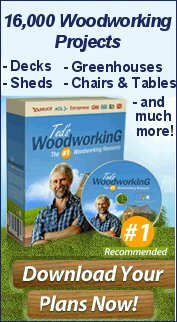 An easy garden craft project! I always do my wood burning line work before I start to base paint my project. If paint gets in any of the burned areas don't worry, I always go back over the lines with my wood burning tool to remove any unwanted paint after I'm done painting . 6. CHARCOAL: Put Ladybug spots on face, wings and hands, Paint eyes, nose, mouth and put freckles on cheeks. 7. LIGHT FOLIAGE: Spatter leaves with old toothbrush. 8. IVORY: Put dots on flowers with your styles, paint eyes. 9. NAVY BLUE: Put dots on flowers with your styles. 10. BLACK TECHNICAL PEN: Put the saying "Ladybug Hugs" on the flower. 11. SANDING: Sand along the edges of the painted areas on all wood pieces. 13. GLUE: Wings and arms to the Ladybug with Wood glue, Hot Glue Bow. 14. ATTACH: Blue wire from hanger, Raffia bow and Black Pipe Cleaner. 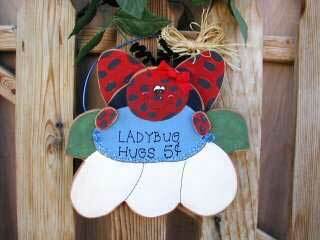 I do hope you enjoy making "Ladybug Hugs". She is a cute addition to your summer decorations.